As the top two teams in the competition, all eyes were on the days first match between Melbourne teams, Avant and Order. This match would decide who gets bragging rights in the southern city and also who would take the top spot. With both teams at a 3-0 record and refusing to give an inch, the fact this match went the full seven games shouldn’t surprise anyone. RumoursofGhosts for Avant was a standout in this set, winning all three of his games to allow his team to clinch victory and remain at the top. After a shaky series last week, Travisstyles also returned to form and put the pressure on Spaceghost and Llama to keep Order in the fight. The next match was the most underrated important match of the day. Sure there were no city bragging rights on the table, but there was the real chance for Deceptors to maybe slip through and have a chance at a finals spot. A win over Perth would have put them just one win, and a bit of luck, away from making the finals in two weeks. It was not to be, however, as Perth took the match in the biggest blowout this week. A clean sweep for Ground Zero was not without its moments for either team. Robbie continues to remain just outside the top calibre with another very close loss to Freeser in an Alex mirror match. Never failing to make the games hype, Robbie’s Alex is always fun to watch. The biggest surprise of the match was Rupps playing Abigail in his game against M0nt. He justified this character choice as “if you’re playing someone without a brain, play Abigail”, referring to M0nt’s crazy Laura gameplay. The pick worked for him and a secondary character should help the team as they move into finals. The final game was the Sydney derby. Unlike Melbourne, this was not expected to be a close one. The Chiefs have been one of the strongest teams this season, and the Roar were at the other end of the table. Proving everyone wrong, however, the Roar put up a substantial fight with some big names falling for Chiefs. Damosk started things off with a new character choice, opting to play G against BKsama’s Urien. This didn’t bode well for the president of the world, however, as BK rolled through him. Unfamiliarity with the character and buttons to press in certain situations was apparent for Damosk. A solid second round comeback looked on the cards with some highlight-worthy plays by Damosk, but it never came. If Damosk wants to stick with this character it can only help him, but with one week left in the competition, it’s now or never to learn it. He moved back to Balrog in his second game and managed to take down Schenkhan. A big standout in the match was Fangrear. Known for his nervousness, he overcame those fears today and grabbed a win over Street Fighter mainstay, ZG. Slipping back into a more aggressive style, a vast shift from his nervous, passive style in previous weeks, Fangrear was able to push ZG to the limit and overcome his demons. Fangrear should use this win as a confidence boost moving forward and learn to control the nerves. Chiefs managed to take the match 4-2, moving alongside Order as equal second place before they have to face them next week. As finals approaches and we have our teams, it is now a good time to reflect on players to watch in the coming weeks. Order have both Travis and Bug as rocks, along with Camzace to back them up if they need to call in the reinforcements. With good defensive players and some crazy offense when they need it, they should continue to be a threat as the regular season ends. Avant have the superteam-esque lineup of Rumours/SpaceGhost/Llama, but are lacking some depth in their subs. Rumours especially is not to be discounted as he has definitely earned the ‘Mr Gfinity’ title over the past two seasons. The Chiefs have a big three, but also depth to the roster in case of emergency. 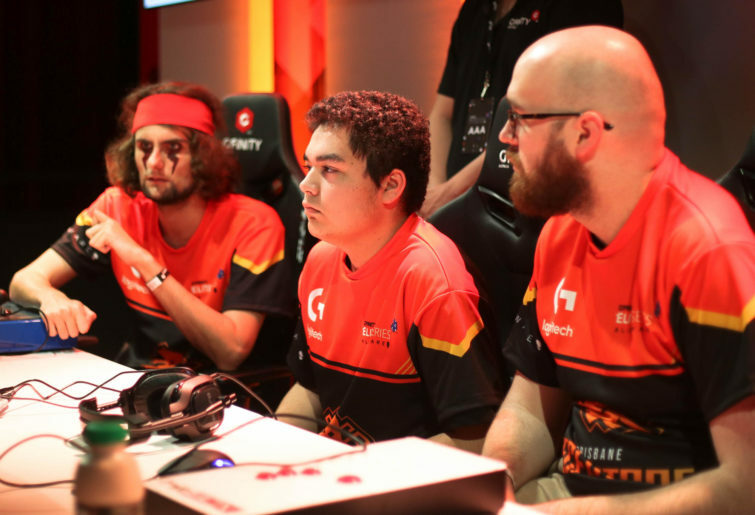 Big names like Somniac, ZG and BKsama are joined by newer players in Schenkhan and DaBigChoppa, who have both made their mark on the scene this season. Finally, as I’ve been saying most weeks, Ground Zero is the big wildcard of this final series. Rupps, Syo, Freeser and Ghostchips have all shown what they can do. They just have to make sure they turn up when it matters.